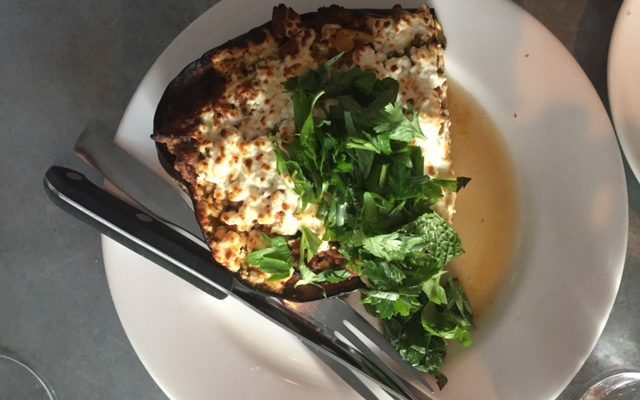 Can you imagine a more delicious dish than this eggplant stuffed with ground lamb, onion, garlic, spices and then topped with feta? I have made these vegetarian as well by opting for chopped sauteed wild mushrooms in place of the lamb. This is a great dish for entertaining and freezes well. Brush the cut sides of the eggplants with some olive oil and season with salt and pepper. Place cut side down on a roasting pan and roast until tender about 20 minutes. Meanwhile, heat 2 Tb. of olive oil in a large skillet and saute the onions with the half the spices over medium heat, stirring often. Add the lamb, pine nuts, tomato paste, half the sugar, salt and pepper to taste. Brown the lamb and set aside. Combine the remaining spices, water, lemon juice, tamarind, sugar, cinnamon and salt and pepper to taste in a small bowl and whisk. Reduce the oven to 375. Spoon the lamb mixture on top of each eggplant half and add the water mixture to the bottom of the pan. Cover with foil and roast for 1 hour. Baste the eggplants twice during the cooking time. Crumble the feta over the top and bake until golden about 10 minutes. Remove from the oven and allow them to rest 5 to 10 minutes before serving.